(The article General Anti-Oxidant Actions contains much relevant background material which will assist in understanding this article). Selenium compounds exert their biological effects either directly or by being incorporated into enzymes and other bio-active proteins. The main inorganic dietary form of selenium is sodium selenite (Na2SeO3). In the organic forms selenomethionine and selenocysteine, a selenium atom is present in the position occupied by a sulfur atom in the amino acids methionine and cysteine. Se-methylselenocysteine is selenocysteine modified by the replacement of the hydrogen atom with a methyl group on the selenium atom. In the 1960s the code for the incorporation of amino acids into proteins by tRNA assigned 20 amino acids to 61 of the 64 possible triplet codons (eg, cysteine as UGU or UGC). In the 1990s it was discovered the UGA not only acts as a stop codon, but as a codon for the incorporation of selenocysteine into amino acids. This discovery made UGA the second known dual-function codon, along with AUG (which acts as an initiator as well as a codon for methionine incorporation). The discovery also made selenocysteine the "21st amino acid". In contrast to the specific incorporation of selenium into proteins as selenocysteine coded-for by UAG, however, non-specific incorporation of can occur when selenomethionine is erroneously incorporated instead of methionine or when selenocysteine is erroneously incorporated where cysteine was the correct amino acid. Non-specific incorporation of selenium into protein can be toxic [MOLECULAR AND CELLULAR BIOLOGY; Hatfield,DL; 22(11):3565-3576 (2002)]. Se-methylselenocysteine, however, cannot be specifically or non-specifically incorporated into protein, and is rapidly metabolized to (CH3)2Se & (CH3)3Se+ excretory products) [THE JOURNAL OF NUTRITION; Ip,C; 128(11):1845-1854 (1998)]. Exogenous selenium from both organic and inorganic sources must be converted into hydrogen selenide (H2Se) before it is incorporated into selenoproteins (as selenocysteine). There are nearly 30 known selenoproteins containing selenocysteine. Selenocysteine is the active site of the antioxidant enzymes glutathione peroxidase and thioredoxin reductase, for example. Glutathione peroxidase is the most abundant selenoprotein in mammals. Thioredoxin reductase not only maintains cell proteins in a reduced state, it is essential for providing the deoxyribonucleases required for DNA synthesis [JOURNAL OF BIOLOGICAL CHEMISTRY; Holmgren,A; 264(24):13963-13966 (1989)]. Deiodinases (D1,D2,D3) required for activation and deactivation of T4 thyroid hormone to T3 forms are selenium-containing enzymes [ENDOCRINE REVIEWS; Bianco,AC; 23(1):38-89 (2002)]. Thiol (−SH) compounds can be antioxidant reducing agents (by hydrogen atom donation), but selenium (which sits below sulfur in the same column of the periodic table) is more nucleophilic (electron-rich) and therefore more able to release the hydrogen. Selenium has a 15% longer bond-length than sulfur, which facilitates the formation of selenium-sulfur bonds at the catalytic sites [PROCEEDINGS OF THE NATIONAL ACADEMY OF SCIENCES (USA); Gromer,S; 100(22):126180-12623 (2003)]. The presence of selenocysteine rather than cysteine in thioredoxin reductase not only increases catalytic activity 100−fold, but optimizes the activity at physiological pH [JOURNAL OF BIOLOGICAL CHEMISTRY; Zhong,L; 275(24):18121-18128 (2000)]. Antioxidants like Vitamin E, Vitamin C and Co-Enzyme Q10 neutralize free radicals by becoming free radicals that are less harmful than the ones they neutralize. But the free radical forms of antioxidants must be regenerated or they cannot continue to be effective antioxidants, and may even be damaging. The glutathione and thioredoxin antioxidant systems function to regenerate other antioxidants while themselves providing the primary antioxidant defense in the water phase of the body. Glutathione peroxidase and thioredoxin reductase are two natural antioxidant enzymes that contain selenium and depend upon selenium activity for their antioxidant functionality. Both the glutathione and thioredoxin systems enhance their own antioxidant activity by inducing the production of other natural antioxidant enzymes [TOXICOLOGICAL SCIENCES; Hansen,JM; 82(1):308-317 (2004)], including superoxide dismutase [AMERICAN JOURNAL OF RESPIRATORY CELL AND MOLECULAR BIOLOGY; Das,KC; 17(6):713-726 (1997)]. Both selenite and selenomethionine supplementation have been shown to significantly reduce oxidative DNA damage (8−OHdG formation) due to ultraviolet radiation [BRITISH JOURNAL OF DERMATOLOGY; Rafferty,TS; 148:1001-1009 (2003)]. In 1989 the United States National Research Council established a Recommended Daily Allowance (RDA) for selenium based on maximization of plasma glutathione peroxidase activity [NATIONAL RESEARCH COUNCIL:RECOMMENDED DIETARY ALLOWANCES; 10th Edition; Washington, D.C., National Academy of Sciences, 1989]. Making conservative allowances for body weight and safety, 70μg/day for adult men and 55μg/day for adult women were established as the RDAs for selenium. Despite many discoveries and much research, the official guidelines for recommended selenium minimums have seen little change since 1989. For example, the RDA is inadequate for full activity of the extracellular protein selenoprotein P, which binds to endothelial cells and protects them from peroxynitrite [ANNUAL REVIEW OF NUTRITION; Bunk,RF; 25:215-235 (2005)]. Selenoprotein P also functions to transport selenium to the brain [THE JOURNAL OF NUTRITION; Hill,KE; 134(1):157-161 (2004)]. In 1996 the JOURNAL OF THE AMERICAN MEDICAL ASSOCIATION published the results of a multi-center, double-blind, randomized, placebo-controlled cancer prevention trial based on 200μg/day selenium or placebo to 1,312 patients over a mean period of 4.5 years [JOURNAL OF THE AMERICAN MEDICAL ASSOCIATION; Clark,LC; 276(24):1957-1963 (1996)]. The study reported a 50% decrease in total cancer incidence as well as a 63% reduction in prostate cancer, a 58% reduction in colorectal cancer and a 48% reduction in lung cancer. Only 6 of the 1,312 subjects had selenium blood levels below that achievable by the RDA prior to supplementation. Not only was this study a powerful refutation of the claim that dietary supplements are of no benefit, but its results were so impactful that it would be unethical for anyone to repeat it. After extensive scrutiny of the data only the evidence for reduction of prostate cancer is now accepted as statistically significant (for a 42% reduction in prostate cancer). The data still shows a total cancer mortality reduction of 51% [CANCER EPIDEMIOLOGY BIOMARKERS &AMP; PREVENTION; Duffield-Lillico,AJ; 11(7):630-639 (2002)]. Selenium has so many anti-cancer actions that it is difficult to establish which ones are predominant. Selenium affects oxidative stress, DNA methylation, DNA repair, inflammation, apoptosis, cell proliferation, carcinogen metabolism, hormone production, angiogenesis and immune function [JNCI, JOURNAL OF THE NATIONAL CANCER INSTITUTE; Taylor,PR; 96(6):645-647 (2004)]. Cancer begins with DNA mutation, aberrant DNA methylation or defective cell-cycle control. DNA is normally protected from cancer-causing substances by methyl groups, but selenium deficiency (like folic acid deficiency) can result in decreased DNA methylation and therefore increased DNA damage and mutation [THE JOURNAL OF NUTRITION; Davis,CD; 133(9):2907-2907 (2003) and THE JOURNAL OF NUTRITION; Davis,CD; 130(12):2903-2909 (2000)]. Selenium also promote the activity of p53 protein, which is often called "the guardian of the genome". Well over half of all cancers have defective p53 protein. When DNA is damaged, p53 either stimulates DNA repair or causes cells to self-destruct (apoptosis) if the DNA damage is irreparable. The thioredoxin reductase system promotes p53 induction of DNA repair enzymes [PROCEEDINGS OF THE NATIONAL ACADEMY OF SCIENCES (USA); Seo,YR; 99(22):14548-14553 (2002)]. Cells exposed to selenomethionie have shown a 3-fold increase in p53 activity [JNCI, JOURNAL OF THE NATIONAL CANCER INSTITUTE; Longtin,R; 95(2):98-100 (2003)]. Healthy wound-healing involves a well-coordinated immune/inflammatory response. Neutrophils and macrophages (immune system cells) enter the wound and fight bacteria by creating toxic free radicals like hydrogen peroxide, peroxynitrite and the hydroxyl radical. Antioxidant enzymes like selenium-containing glutathione peroxidase and thioredoxin reductase protect neutrophils, macrophages and other tissues from the free radicals intended to destroy pathogens. Macrophages release growth factors to promote tissue re-growth. With chronic inflammation, however, these natural mechanisms run amuck into cycles of tissue regeneration and destruction, creating an environment conducive to cancer-development [NATURE; Coussens,LM; 420:860-867 (2002) and NATURE REVIEWS, IMMUNOLOGY; Karin,M; 5(10):749-759 (2005)]. Continuous exposure to the free radical peroxynitrite leads to DNA mutation. Growth factors from macrophages promote proliferation of new cancer cells. An estimated 15% of cancers are attributed to inflammation associated with chronic infections, such as hepatitis, papillomavirus, and the gastric bacterium Heliobacter pylori [JOURNAL OF INTERNAL MEDICINE; Kuper,H; 248(3):171-183 (2000)]. Non-infectious causes of chronic inflammation such as tobacco smoke and asbestos also contribute significantly to cancer. Selenium compounds have been shown to block DNA transcription factors that would otherwise worsen the inflammatory response [FREE RADICAL BIOLOGY &AMP; MEDICINE; Jozsef,L; 35(9):1018-1027 (2003) and JOURNAL OF BIOLOGICAL CHEMISTRY; Yoon,SO; 276(23):20085-20092 (2001)]. And selenium compounds are very effective at protecting cells (particularly endothelial cells) from peroxynitrite-induced DNA damage (less than 5% of which is due to hydroxyl radical production) [ARCHIVES OF BIOCHEMISTRY AND BIOPHYSICS; Roussyn,I; 330(1):216-218 (1996)]. Glutathione peroxidase and possibly other selenoproteins directly reduce peroxynitrite to nitrite [JOURNAL OF BIOLOGICAL CHEMISTRY; Sies,H; 272(44):27812-27817 (1997)]. Selenomethionine was shown to be more effective than selenocysteine, whereas sodium selenite had no effect [BIOCHEMICAL JOURNAL; Briviba,K; 319(Pt 1):13-15 (1996)]. Because thioredoxins increase transcription, inhibit apoptosis and stimulate cell proliferation & angiogenesis while providing antioxidant defense, thioredoxins are overexpressed in some cancer cells to promote their growth and increase resistance to therapy. The anti-carcinogenic chemotherapeutic agent motexafin gadolinium selectively localizes in cancer cells and blocks thioredoxin oxidase, thereby enhancing the effectiveness of other anti-cancer drugs and radiation therapy [CANCER BIOLOGY &AMP; THERAPY; Biaglow,JE; 4(1):6-13 (2005)]. AIDS patients who are selenium-deficient are nearly 20 times more likely to die from HIV-related causes as patients with adequate selenium [JOURNAL OF ACQUIRED IMMUNE DEFICIENCY SYNDROMES AND HUMAN RETROVIROLOGY; 15(5):370-374 (1997)]. Selenium deficiency increases the virulence of viral infection by causing more pro-inflammatory immune response [THE JOURNAL OF NUTRITION; Beck,MA; 133(5 Suppl 1):1463S-1467S (2003)] and by boosting T-cell production [THE AMERICAN JOURNAL OF CLINICAL NUTRITION; Broome,CS; 80(1):154-162 (2004)]. Neutrophils with reduced glutathione peroxidase due to selenium deficiency are less able to defend themselves against the free radicals they release onto pathogens [THE JOURNAL OF NUTRITION; Boyne,R; 116(5):816-822 (1986) and THE JOURNAL OF NUTRITION; Davis,CD; 133(5 Suppl 1):1457S-1459S (2003) and AIDS RESEARCH AND HUMAN RETROVIRUSES; Sappey,C; 10(11):1451-1461 (1994)]. An experiment with aged mice showed that sodium selenite supplementation above the normal levels of selenium could restore lymphocyte proliferation due to antigens to the levels of young adult mice [PROCEEDINGS OF THE SOCIETY FOR EXPERIMENTAL BIOLOGY AND MEDICINE; Roy,M; 209(4):369-375 (1995)]. Previously, the same experimenters had shown that increasing selenium above normal levels in young adult mice increased the bacteria-killing activity of spleen lymphocytes by 22.3% [PROCEEDINGS OF THE SOCIETY FOR EXPERIMENTAL BIOLOGY AND MEDICINE; Roy,M; 193(2):143-148 (1990)]. Humans supplemented with 200μg/day of selenium for 8 weeks showed a 118% increase in lymphocyte cytotoxicity and an 82.3% increase in natural killer cell activity [BIOLOGICAL TRACE ELEMENT RESEARCH; Kiremidjian-Schumacher,L; 41(1-2):115-127 (1994)]. The thyroid gland contains more selenium per gram of tissue than any other organ. Hydrogen peroxide is produced to catalyze iodination of thyroglobulin, which is degraded by glutathione peroxidase (thereby controlling the rate of thyroglobulin production [ENDOCRINOLOGY; Ekholm,R; 138(7):2871-2878 (1997)]. The selenium-containing iodothyronine deiodinase enzyme converts thyroid hormone from inactive (T4) to active (T3) form. Thyroid problems have been linked to selenium deficiency [BIOLOGICAL TRACE ELEMENT RESEARCH; Olivieri,O; 51(1):31-41 (1996)]. T3 normally controls the rate of metabolism and the activity of many other hormones. Although most T3 production occurs in the liver, the thymus gland (which produces T-cells) has a local form of iodothyronine deiodinase, which indicates the importance of selenium for the development and function of thymic cells [THE JOURNAL OF ENDOCRINOLOGY; Molinero,P; 146(1):105-111 (1995)]. Selenium supplementation may prove to be of benefit in hypothyroidism [JOURNAL OF CLINICAL ENDOCRINOLOGY &AMP; METABOLISM; Duntas,LH; 95(12):5180-5188 (2010)]. The major non-cardiac cause of death in American hospitals is sepsis due to infection, resulting in more than 100,000 deaths per year in the US. Two thirds of those cases occur in patients who have been hospitalized for other conditions [HARRISION�S PRINCIPLES OF INTERNAL MEDICINE 14th Edition (1998) page 776]. Selenium not only protects against sepsis by boosting the immune system, but it acts directly against bacterial lipopolysaccharide (LPS), a large molecule that contributes significantly to endotoxic shock (death due to bacterial toxins) [EXPERIMENTAL BIOLOGY AND MEDICINE; Kim,SH; 229(2):203-213 (2004)]. Multiple organ failure, the leading cause of death in intensive care units, is often caused by systemic sepsis. Elderly people worried about the risk of hospital infections should also consider selenium supplementation as part of their protection against influenza. The natural selenium-containing antioxidant enzymes like glutathione peroxidase and thioredoxing reductase have the potential to reduce the effect of free radicals on the aging process. Disulfide bonds (bonds between sulfur atoms) can cross-link proteins, decreasing enzyme function and increasing the sinew associated with aging collagen. Thioredoxin reductase is particularly effective in reducing disulfide bonds [THE EMBO JOURNAL; Stewart,EJ; 17(19):5543-5550 (1998)]. Transgenic mice which overexpress human thioredoxin have shown a 35% increase in median life span and a 22% increase in maximum lifespan [ANTIOXIDANTS &AMP; REDOX SIGNALING; Mitsui,A; 4(2):693-696 (2002)]. Methionine sulfoxide reductase is an unusual enzyme which directly repairs oxidative damage to the methionine residues in proteins. There are two forms of methionine sulfoxide reductase, one of which contains selenium at its active site. Both forms are dependent upon the thioredoxin system for regeneration. Selenium deficiency has been shown to increase protein oxidation in mice [PROCEEDINGS OF THE NATIONAL ACADEMY OF SCIENCES (USA); Moskovitz,J; 100(13):7486-7490(2003)]. Transgenic fruit flies that over-express the non-selenium-containing methionine sulfoxide reductase have shown a 70% increase in lifespan [PROCEEDINGS OF THE NATIONAL ACADEMY OF SCIENCES (USA); Ruan,H; 99(5):2748-2753 (2002)]. DNA damage has been associated with aging. So-called accelerated aging diseases are generally due to defective DNA repair. An epidemiological study has shown a statistically significant relationship between low selenium blood levels and high levels of DNA damage [CANCER, EPIDEMIOLOGY, BIOMARKERS &AMP; PREVENTION; Karunasinghe,N; 13(3):391-397 (2004)]. AP−1 (Activator Protein−1), like NF−κB is a transcription factor that promotes inflammatory response, immune function, cell adhesion and cell growth. The phosphorylation of the proteins Fos and Jun -- which is necessary for AP−1 activation -- is mediated by two MAPK (Mitogen-Activated Protein Kinase) growth factor pathways: ERK and JNK, respectively. Selenium compounds inhibit the JNK & p38 MAPK growth factor pathways, but not the ERK MAPK pathway [JOURNAL OF BIOLOGICAL CHEMISTRY; Zhong,L; 275(4):2527-2531 (2000)]. Not only is hydrogen peroxide-induced activation of JNK activity inhibited by selenium compounds, but hydrogen peroxide-induced DNA-binding of AP−1 is also inhibited [BRITISH JOURNAL OF PHARMACOLOGY; Yoshizumi,M; 136(7):1023-1032 (2002)]. The p38 MAPK is required for NF−κB-dependent gene transcription of pro-inflammatory cytokines (like IL−1 and TNF−α) in monocytes & macrophages [JOURNAL OF BIOLOGICAL CHEMISTRY; 274(43):30858-30863 (1999)]. Oxidative stress promptly induces translocation of the redox protein thioredoxin from the cytoplasm to the nucleus, where it can create the reduced environment which is required for the AP−1 and NF−κB to bind to DNA. A reduced state is also required for NF-E2-related factor 2 (Nrf2) binding to DNA. Nrf2 is a transcription factor of the regulatory gene sequence for producing antioxidant enzymes, the Antioxidant Response Element (ARE). Selenium deficiency is associated with increased cardiovascular disease [MEDICAL SCIENCE MONITOR; Alissa,EM; 9(1):RA9-RA18 (2003)]. Selenoprotein P -- which accounts for half of the selenium content of human serum -- protects endothelial cells from peroxynitrite [Ibid] and protects LDL cholesterol against oxidation [FREE RADICAL RESEARCH; Traulsen,H; 38(2):123-128 (2004)]. Other protective effects against cardiovascular disease afforded by selenium include the effect on antioxidant enzyme activity, modulation of platelet aggregation and protection against toxic heavy metals [JOURNAL OF CARDIOVASCULAR RISK; Neve,J; 3(1):42-47 (1996)]. Nonetheless, a large randomized clinical trial of 200μg/day of selenium from baker's yeast tablets showed no benefit in prevention of cardiovascular disease over a 13-year period [AMERICAN JOURNAL OF EPIDEMIOLOGY; Stranges,S; 163(8):694-699 (2006)]. Thyroid hormone and selenium-containing deiodinase enzymes are critically important for brain development during pregnancy [JOURNAL OF CLINICAL ENDOCRINOLOGY &AMP; METABOLISM; Kesler,MH; 89(7):3117-3128 (2004)]. Selenium deficiency can lead to epileptic seizures and may even contribute to Parkinson's disease [BRAIN RESEARCH, BRAIN RESEARCH REVIEWS; 45(3):164-178 (2004)]. Thioredoxin is particularly protective against ischemia-reperfusion injury in the brain [THE EUROPEAN JOURNAL OF NEUROSCIENCE; Rybnikova,E; 12(5):1669-1678 (2000)]. In mammals, the selenium-containing Phospholipid Hydroperoxidase Glutathione Peroxidase (PHGPx) enzyme is not only an antioxidant, but is an essential structural protein in spermatazoa [BIOLOGY OF REPRODUCTION; Foresta,C; 67(3):967-971 (2002) and SCIENCE; Ursini,F; 285:1393-1396 (1999)]. Selenium deficiency can contribute to osteoarthritis [OSTEOARTHRITIS AND CARTILAGE; Kurz,B; 10(2):119-126 (2002)]. Selenium protects against toxic metals such as mercury [BIOCHEMICAL AND BIOPHYSICAL RESEARCH COMMUNICATIONS; Yoneda,S; 231(1):7-11 (1997) and arsenic [JOURNAL OF INORGANIC BIOCHEMISTRY; Zeng,H; 99(6):1269-1274 (2005)]. Large (one milligram daily) doses of sodium selenite have reduced mortality from septic shock by one-quarter [CRITICAL CARE MEDICINE; Angstwurm,MWA; 35(1):1-9 (2007)]. A randomized, placebo-controlled clinical trial found that over a period of eight years, persons taking 200μg/day of selenium had a nearly 50% increased incidence of type 2 diabetes [ANNALS OF INTERNAL MEDICINE; Stranges,S; 147(4):217-223 (2007)]. Overexpression of the selenoprotein glutathione peroxidase has led to insulin resistance in mice [PROCEEDINGS OF THE NATIONAL ACADEMY OF SCIENCES (USA); McClung,JP; 101(24):8852-8857 (2004)]. Dietary selenium is primarily inorganic selenite or organic selenomethionine. Dietary selenite is more than 80% bioavailable and dietary selenomethionine is more than 90% bioavailable [ANNUAL REVIEW OF NUTRITION; 4:257-280 (1984)]. Selenomethionine is the major seleno-compound in cereal grains, legumes, soybeans and yeast [JOURNAL OF THE AMERICAN COLLEGE OF NUTRITION; Whanger,PD; 21(3):223-232 (2002)]. Brazil nuts can be the richest food source of selenium. Meats and fish can be good sources of selenium, but the amount of selenium in fruits and vegetables is typically low. Garlic, onlions, leaks and broccoli florets, however, are sources of the selenium-containing compound Se-methylselenocysteine. Selenite has greater capacity to cause DNA damage (single-strand breaks), but is more effective in cancer prevention than selenomethionine [THE JOURNAL OF NUTRITION; Ip,C; 128(11):1845-1854 (1998)]. Selenite's anti-cancer properties seem related to its cytotoxic capacity to increase cell cycle arrest and induce apoptosis [CANCER RESEARCH; Zhong,W; 61(19):7071-7078 (2001)]. Se-methylselenocysteine induces apoptosis through caspase activation, whereas selenite can induce necrosis. Se-methylselenocysteine inhibits cell growth by inhibiting the enzyme PI3−K [BREAST CANCER RESEARCH; Unni,E; 7(5):R699-R707 (2005)]. Se-methylselenocysteine, however, not only has less capacity for toxicity, but may be the most effective of the selenium compounds for cancer prevention [CARCINOGENESIS; Kim,T; 22(4):559-565 (2001) and ANTICANCER RESEARCH; Smith,ML; 24(3a):1401-1408 (2004)]. Se-methylselenocysteine induces phase 2 detoxifying enzymes. 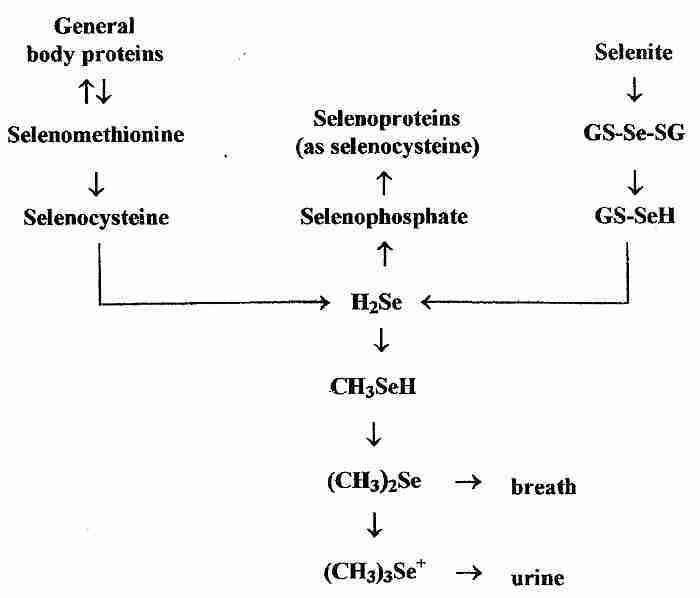 Se-methylselenocysteine cannot be incorporated into proteins, and is rapidly excreted -- lowering the danger of excessive selenium accumulation (though precluding the possibility of specific selenocysteine incorporation into selenoproteins). The selenium content of foods depends greatly upon the selenium content of the soil from which it arises. The Great Plains of the USA and Canada are rich sources of selenium, whereas the soils of the northeast, northwest and Florida are lower. The selenium-content of soils in Europe and the selenium blood levels of Europeans are generally much lower than what is seen in North America. Selenium is particularly low in the soils of Finland, New Zealand and central parts of China [THE BRITISH JOURNAL OF NUTRITION; Combes,GF; 85(5):517-547 (2001)]. Selenium can be dangerously toxic in higher doses, so a "more is better" attitude is especially hazardous with this mineral. Selenium-poisoning is associated with liver cirrhosis, neurological damage and skin lesions. A 1989 study in China estimated 800μg/day as the upper safe limit, and cut this to 400μg/day for a large margin of safety [JOURNAL OF TRACE ELEMENTS AND ELECTROLYTES IN HEALTH AND DISEASE; Yang,G; 3(3):123-130 (1989)]. This recommendation was adopted by the World Health Organization [World Health Organization (1996) Selenium. In TRACE ELEMENTS IN HUMAN NUTRITION AND HEALTH, pp.105-122, Geneva, WHO]. Life extensionists taking many supplements from many sources should pay careful attention to ensure that their total selenium intake does not exceed 400μg/day.